From the Bruce Highway, turn east into the Green Hills Road at the Ilbilbie Roadhouse and than turn left again at the Cape Palmerston turn off, 7 kilometres from the highway. 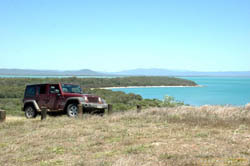 The road to the boundary of the Cape Palmerston National Park is a development road and is of reasonable quality although part sealed and part dirt. At the boundary of the park there are two options: If the inland route is open then proceed straight ahead or turn right and follow the track to the beach . There is a little camp spot at the beach, and a couple more south of the exit. At low tide the beach is much quicker but 4WD will be needed rounding Coconut Point (also know as Shifty Point).